The colours should all be on their spots, and the triangle should be as close to, but not touching, the pink as possible. Realise that there is no requirement in the rules for ensuring that all reds are touching in the triangle. In fact, you shouldn't try to make them all touch, because when you do, you force the reds down into the cloth creating impressions that could later cause kicks or other errors. The first player has the ball in his hand, and places it in the "D". 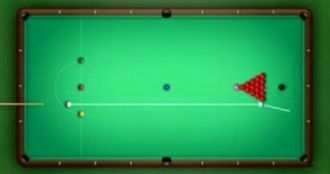 b) places in the "D"
The cue ball is placed in the "D" such that the centre line of the cue ball is either within or sitting directly on the lines defining the "D"
the player plays a stroke. He does not foul if he positions the cue ball with his cue, even the cue tip, because he is not playing a stroke. He does not foul if he knocks another ball whilst placing the cue ball, because he is not playing a stroke. If he has fouled, the table is not reset and the frame is not restarted; play simply continues from the resulting position of his foul. Note: If there are fewer that 15 Red balls in the triangle, then from any spot in the "D", you are snookered on all Red balls.